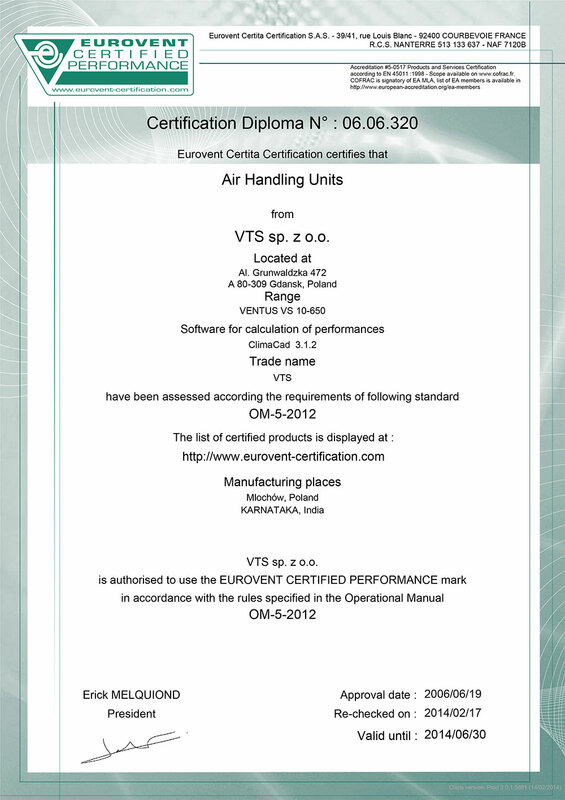 VTS India has been awarded the EUROVENT certificate! VTS India has been awarded the prestigious EUROVENT certification! The Company fulfilled strict requirements concerning calculation of device parameters, process of its installation, quality of components and the product itself. Thorough tests conducted simultaneously in the TUV lab showed that the VENTUS units assembled in Poland and in India obtain the same quality results. This is the proof that VTS, irrespective of the location, takes special care that the quality of the services and products it offers is always on the same, highest level. The EUROVENT Certificate in India is a success measured in a long and quality-oriented work that will certainly bring us closer to the position of the market leader.